With the increasing cases of antibiotic resistance in patients, the World Health Organization (WHO) has categorised antibiotics and announced a new advisory on which of these antibiotics can be used for common infection and which ones to be preserved for more serious circumstances. This comes as an addition to the WHO Essential Medicines List (EML) for the year 2017. The updated list specifies new uses for nine already-listed products and adds 30 medicines for adults and 25 for children, bringing the total to 433 drugs deemed essential for addressing the most important public health needs. The EML is used by many countries to increase access to medicines and guide decisions about which products they ensure are available for their populations. 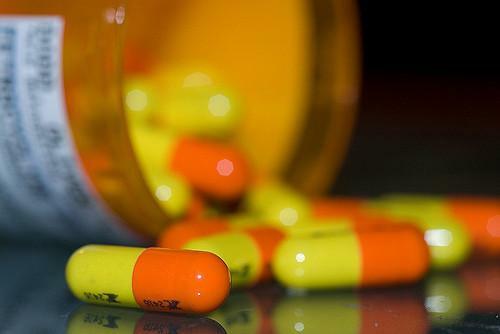 Antibiotic resistance is one of the biggest threats to global health. It has become harder to cure people of pneumonia, tuberculosis and gonorrhea as the antibiotics used to treat them have become less effective. This leads to longer hospital stays, higher medical bills and increased mortality. Emergence and spread of antibiotic resistance is made worse by the fact that antibiotics for human or animal use can be bought as over-the-counter medicine. Similarly, in countries without standard treatment guidelines, antibiotics are often over-prescribed by health workers and veterinarians and overused by the public. In the biggest revision of the antibiotics section in the EML’s 40 years of history, WHO experts have categorised antibiotics into three section—Access, Watch and Reserve—with recommendations on when each category should be used. WHO recommends that antibiotics in the Access group to be available at all times, as this includes treatments for a wide range of common infections, like amoxicillin, a widely used antibiotic to treat infection like pneumonia. 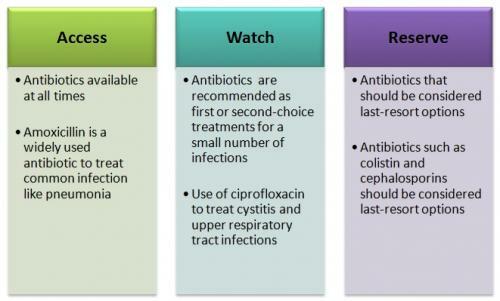 The Watch group includes antibiotics that are recommended as first or second-choice treatments for a small number of infections. For example, the use of ciprofloxacin, used to treat cystitis (a type of urinary tract infection) and upper respiratory tract infections (such as bacterial sinusitis and bacterial bronchitis), should be dramatically reduced to avoid further development of resistance. "The rise in antibiotic resistance stems from how we are using and misusing these medicines," says Suzanne Hill, director of Essential Medicines and Health Products. "The new WHO list should help health system planners and prescribers ensure people who need antibiotics have access to them, and ensure they get the right one, so that the problem of resistance doesn’t get worse," she adds. The objective behind this revision is to ensure that antibiotics are available when needed and right antibiotics are prescribed for the right infections. It should enhance treatment outcomes, reduce the development of drug-resistant bacteria, and preserve the effectiveness of "last-resort" antibiotics that are needed when all others fail. The EML or WHO Model list of essential medicines was launched in 1977, coinciding with the endorsement by governments at the World Health Assembly of “Health for all” as the guiding principle for WHO and countries’ health policies.